Chicken combine with curry taste make a very tasty and unique appetiser. 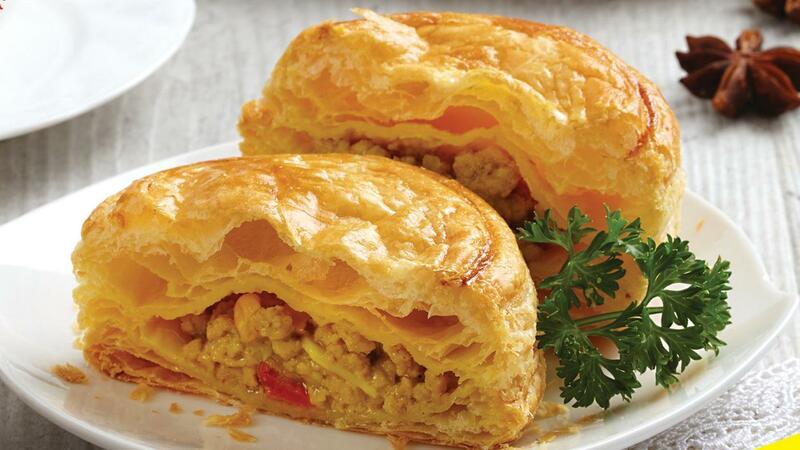 The light and crispy pastry will bring more enjoyable moment. Stir all dry ingredients, and add some water, margarine, stir them well until halfly smooth. Make the dough into a ball and leave it about 10 minutes. Cross cut the dough, put pastry fat in the middle (opening envelop) and roll it longwise. Fold with single fold, turn it 90oand roll it again with single fold. Leave it for about 20 minutes. Do the previous steps for five or six single fold. Leave the dough about 20 minutes for every 2 times fold. Melt margarine into a pan. Sauté onion and garlic until they smell well. Sauté yellow seasoning until smell well and put on all ingredients except coconut milk and cake flour. Before finish cooking, pour some coconut milk and add some cake flour, stir them well until it’s getting coagulated. Roll the puff pastry dough about 3mm thick, round cut 8 cm in diameter for top and bottom side. Smear the dough with beaten egg on all sides, also in the middle side of the filling. Then, cover it using 10 cm in diameter dough. Leave it for about an hour in the chiller for overnight to get maximum result. Smear the dough with beaten egg on all sides and bake it at 200oC until it’s ready to serve.